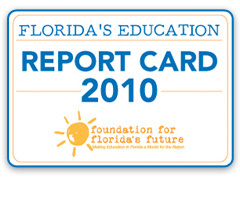 The Jeb Bush Foundation for Florida's Future has released their 2010 Education Report Card. Once again, I am honored to receive an "A" from this important organization. Florida's Education Report Card grades legislators on their efforts to improve the quality of education in the Sunshine State. Grades are based on votes, leadership and extra credit for extra effort. By grading lawmakers on a scale of A - F, just like students, we give parents and the public a clear and comprehensive assessment of who is keeping the promise of a quality education in the Sunshine State - and who is not. As the parent of two children who attended public schools in Hillsborough County and who now both attend college, I am reminded every day how important a quality education is to assure the best opportunity for future success in life. That’s why I have never wavered in my commitment to providing all students in Florida the opportunity to earn a world-class education even during these difficult economic times facing our state. Our new state budget for the next fiscal year (which actually begins July 1, 2009) protects classroom funding and actually provides an increase in per-student funding, to a statewide-average of $6873. In fact, over the last ten years, we've increased per student funding by over 43%. That means in a classroom with 18 students, we are investing over $123,000 per classroom! I am proud to say that our budget places the highest priority on education. But we know it is not only how much we spend on education that matters; how we spend it matters too. In recent years, we've raised standards, demanded accountability and offered innovative opportunities for Florida’s students. And student achievement results show that Florida’s students are doing better than ever. The most recent National Assessment of Educational Progress scores, which is the only way to compare reading and math test results from around the country, show that Florida made remarkable educational gains over the past two years. In fact, Florida was one of only four states with significant increases in both fourth and eighth grade reading since 2005. Florida’s fourth graders improved from 28th to 18th in reading and from 24th to 19th in math. This is real progress, but we still have much work to do. 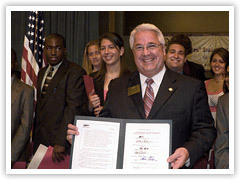 We also know that investing in higher education is investing in the future health of Florida’s economy. Our budget for the next fiscal year actually increases funding for our state universities by almost 3% over the current year. We know that many students rely on financial aid to attend college and you will be glad to know that we maintained full funding for the state’s primary need-based aid program. I have always been a proponent of the Florida Bright Futures Scholarship Program and Pre-paid College Program and will fight to oppose any attempt that would ever seek to eliminate either of these programs. My wife and I are proud of the fact that we have been able to watch both of our children grow up and succeed after attending our local public schools. I am committed to maintaining that level of excellence in our public schools that our community has come to expect. We must continue to invest in the lives of our children and I can assure you as your new State Senator that I will direct every dollar possible into our classrooms.